With the full range of Rival games, 21 Grand Casino provides best gaming entertainment to its customers. The casino is in business since 2009 and it is licensed in the Government of Curacao. Due to license restrictions it does not accept US players. No doubts. This welcome bonus is excellent. All new customers can claim a 300% sign up bonus up to 2000 Euro. This means that a player receives 300% free money on top of the first deposit. For example, if a player deposits 100 Euro he will get 300 Euro for free. If you deposits 500 Euro, he will get 1500 euro extra. We have seen a lot of bonuses in the casino industry, but this seems to be one of the best welcome bonuses available in the world wide web. There are also many ongoing promotions for existing customers. The crazy slot tourney is a weekly promotion and starts every Thursday and ends on Friday morning. 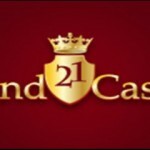 During this tourney a 21 Grand Casino customer can claim three deposit bonuses. The first bonus is a 101%, the second one a 202% and the last deposit bonus is an exclusive 303% match bonus. There are many more promotions like free spins, tourneys or cash-back bonuses. 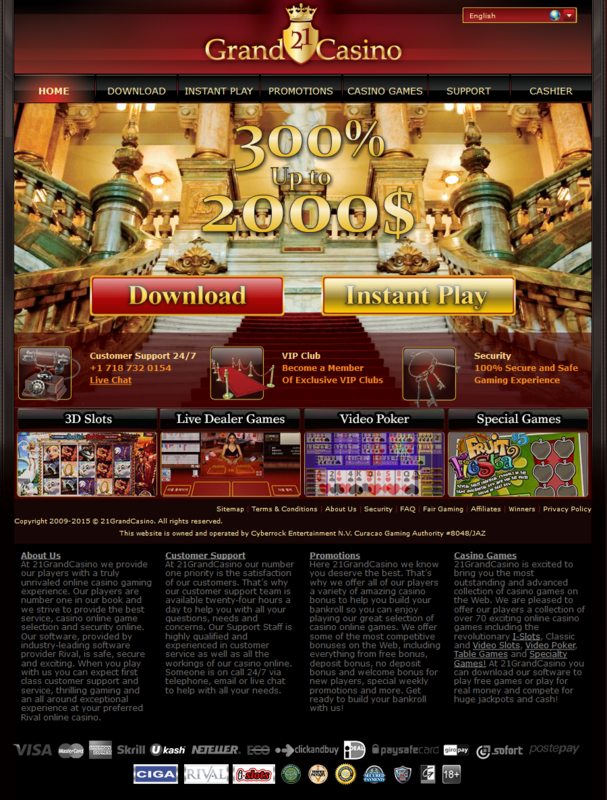 A customer can also become a member of 21 Grand Casino VIP program. While standard users get a monthly cash-back of 17% based on their deposits, VIP members get 20, 25% or even 30% cash-back depending on their VIP status. 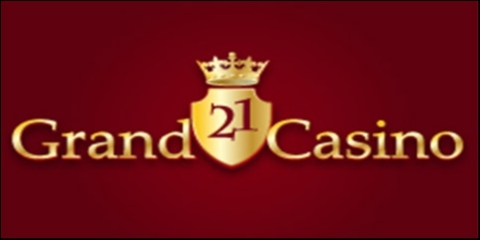 The 21 Grand casino is powered by Rival and can be started by using the software or by launching the instant play version. The Rival software is comfortable and easy to use. The games are downloaded rapidly and in our tests, we never had a single issue with the software as well as the games. If you do not want (or if you can not) install the software on your computer, you can play all the games and slots via instant version. Just log in to your account and click the instant version button to play in your favorite browser like Firefox, IE or Chrome. When it comes to casino games, 21 Grand casino has a lot to offer. Classic table games like Roulette, Baccarat, Keno, Sic Bo, BlackJack, WAR etc. as well as tons of slots like 3- or 5-wheel slots, jackpot slots like Major Moolah or Strike Gold or you can feel the best entertainment on the popular i-slots. All slots are captivating due to their excellent graphics and players will feel like in heaven while playing these exciting slots. 21 Grand casino offers all common banking methods to its customers like Creditcards (Master and Via), eWallets like Skrill (formerly known as Moneybookers) or Neteller, ECO Card and much more. All financial transactions are 128 BIT encrypted to ensure the best possible security. If problems occur which you can not solve without contacting the customer support, you can reach them 24/7 via email, phone call or live chat.